An efficient pool landscaping design presents your home in a light that is modern or futuristic. This is perceived to be an expensive work of art and so many people repel the idea of having a pool landscape. At Land-con, we have pool landscaping ideas for all, including for the people who are on a strained budget. We believe that there are ample swimming pool landscaping ideas that are inexpensive yet very creative. These ideas are easy to build while incurring a minimum cost of installation. Some of these ideas are remarkably simple, due to which you can practically do it the installing on your own. 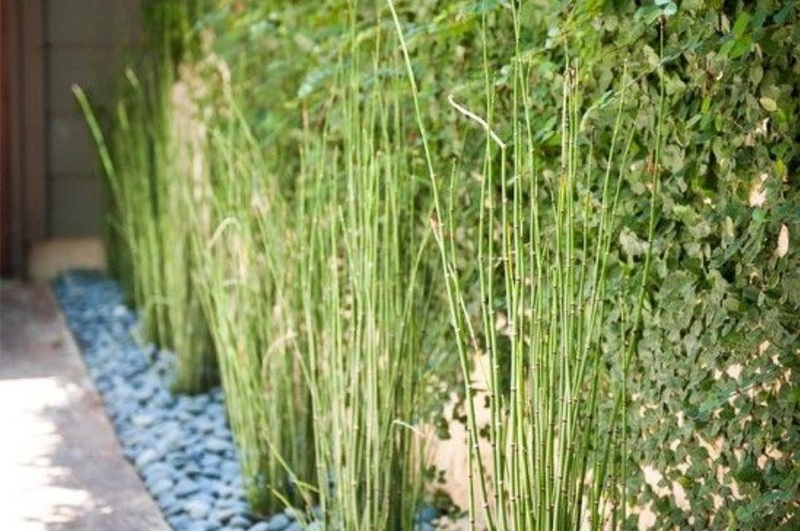 Mentioned below are a few landscaping ideas that are inexpensive and simple, while still providing an incomparably fresh look! 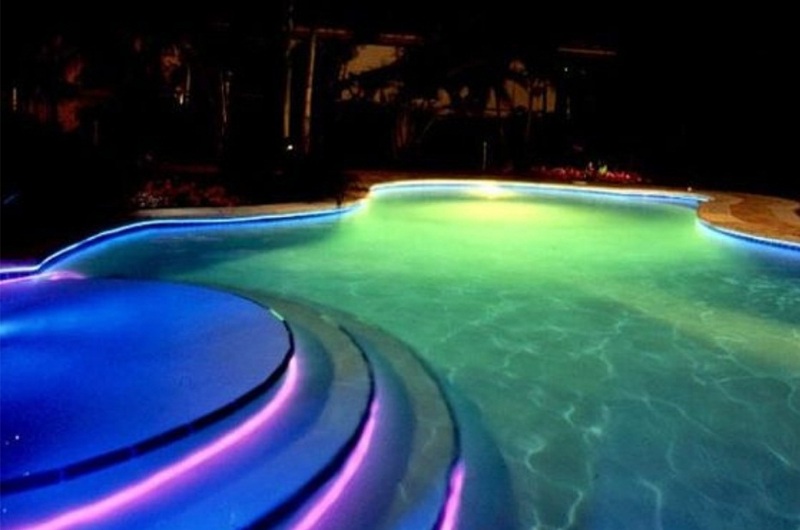 Brighten up your pool from the inside by installing an underwater LED pool lighting. The underwater LED lights come in many colours and are energy efficient, in comparison of incandescent bulbs or halogen lighting. It will help your pool to have a cooler and more vivid appeal while adapting to any occasion. It can also set a warm and peaceful mood for a midnight swim. Also, the LED pool lights can change colour, making it festive-ready for the holidays. If you are looking for an alternate source of light for the pool, then installing a fire-place or fire-fit would be advisable. It looks natural with a non-mechanical source of light. It will add life to your pool parties as it is a stunning accent piece. A tradition that goes back to the old history, a fire-pit is bound to add more vibrancy and keep people warm near-by. 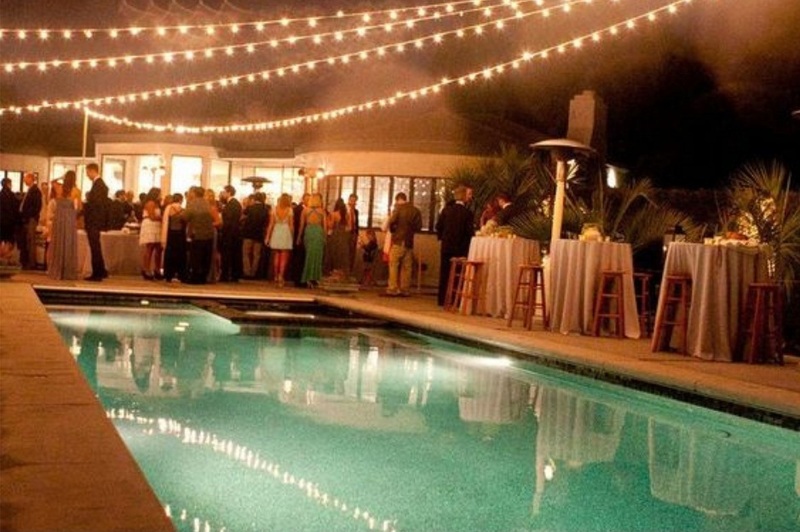 We all have come across the string lighting trend on Instagram and so we believe that adding it around your pool, will make your pool parties literally lit. String lights cast the perfect amount of light and flare. You can easily set up these lights on your own. Choose White LED Lights than large bulbs. While LED Christmas lights are energy efficient and easy to install. It will help you to illuminate your space with an ambient glow. It is far safer to set up these lights than string lights as these are shock-proof. In case you have a smaller space, select an area you wish to highlight or you can simply make a border of these rocks, around the pool deck. Keep your deck and pool dirt-free and clean with stone walkway. 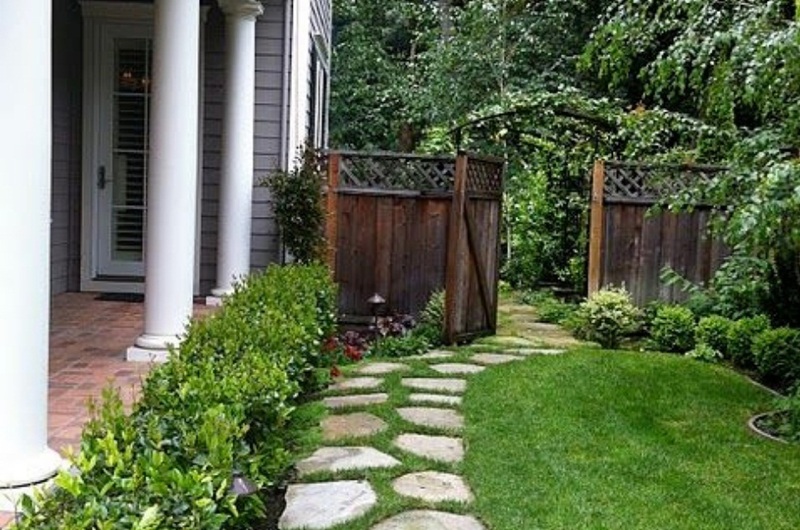 The stone slap walkway is a suitable path with a bit of rustic elegance. You just need to have enough stones that can cover the distance between your pool and your door. There are endless designs and you can get creative yourself with it. Believe in simplicity and de-clutter your pool backyard. Removing things that do not compliment will actually give space to the pieces that do. This can also help you to discover new space, in turn, new opportunities towards optimum utilization of space. Looking For More Cost-Effective Pool Landscaping Designs? Land-Con Pool Design and Build is proud of its reputation for building excellent swimming pools on time and on budget. We have 20 years of combined experience in providing customized swimming pool designs and backyard landscape design services in Toronto, and the Greater Toronto Area. With our commitment to quality, we have earned an excellent reputation. We pride ourselves on offering our customers knowledgeable advice, great service and top quality workmanship. Contact now for an expert consultation!